Ballistix is a decent - for its time - conversion of Reflection's fast-paced Amiga airhockey style game that is set in a fantasy scenario. 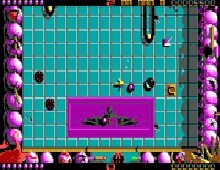 The conversion was done by popular designers DMA Design, known for such great classics as Lemmings, Blood Money and Grand Theft Auto. The graphics look fairly poor compared to the Amiga game. The speech, sound and music of the original game have been lost in the depths of Ballistia. Still, for fans of unconventional sports games such as Speedball, Ballistix is well worth a look.